CUPE Saskatchewan delivered lunch and a donation of one thousand dollars to the picket lines at the Moose Jaw Co-op including downtown Marketplace location, the Moose Jaw Agro Centre, and at Moose Jaw Co-op Gas Bar and refueling stations. “On behalf of CUPE members living and working in Moose Jaw and 30,000 CUPE members from across the province, we urge the Board and Management of Moose Jaw Co-op to rediscover their cooperative values and offer pay equality to your workers,” said Graham from the picket line at Moose Jaw Co-op Marketplace. More than 130 UFCW 1400 members at Moose Jaw Co-op have been on strike since October 2, 2018. The main issue in dispute is pay equity for new hires and classification in a second-tier wage grid. 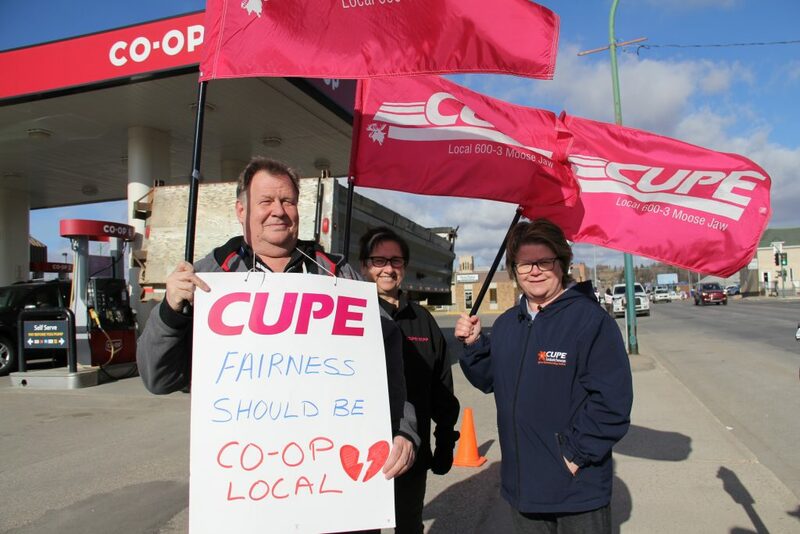 CUPE members are urged to avoid crossing the picket line at all Moose Jaw Co-op locations. CUPE members are also asked to show their support to UFCW 1400 members on the picket line.